Green Building Expo is an affordable way for businesses to connect with potential clients and customers all across Canada – and beyond. The virtual show intends to celebrate Canada’s greenest and most successful building projects. And each exhibit will showcase sustainable construction solutions to a target audience in a timely and cost-efficient manner. Green Building Expo will serve as an ideal platform to bring together technology, materials, products, service providers, developers, general contractors, architects, consultants, engineers, interior designers, builders, specifiers, project managers, green investors, bankers, building owners and facilities managers; not to mention municipalities, expert organizations and other key stakeholders of green building projects. Two of the bonuses available to participants include saving money and eliminating travel time. As well, because it’s not a physical trade show, booth construction costs are eliminated, logistical problems are non-existent and carbon footprints are minimized. The green effect: Not only does the virtual model reduce a company’s carbon footprint on the front end, but it also eliminates the production of materials that will go to waste after an event. Making perfect sense: It’s logical to utilize new technologies and trends — after all, that’s what you’re encouraging your buyer to do. So it goes hand in hand with sustainability. Tracking lead generation: Virtual trade show platforms make it easy to provide prospects with downloadable materials, offer built-in tracking, lead management, and attendee profiles so you know exactly who is downloading what. Saving money: For those who’ve been to trade shows, you know it costs a lot, both to sponsor booths and to attend. Among the expenditures are paying for employee time, travel, lodging, and meals, not to mention the various outlays needed for booths. Then there’s internet, printing, electricity and shipping. There is absolutely no question that exhibiting at a virtual trade show costs significantly less. 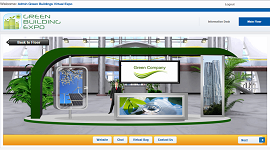 Better time management: Green Building Expo not only allow you to save time on travel, but it houses your virtual booth for six months after the actual event. That means that the money you pay for your space isn’t buying you a few days, it’s buying a more long-term marketing platform. The cool factor: Booths can link directly to an exhibitor’s Twitter, LinkedIn, Facebook or YouTube social media accounts. Impossible to dispute the value of that. 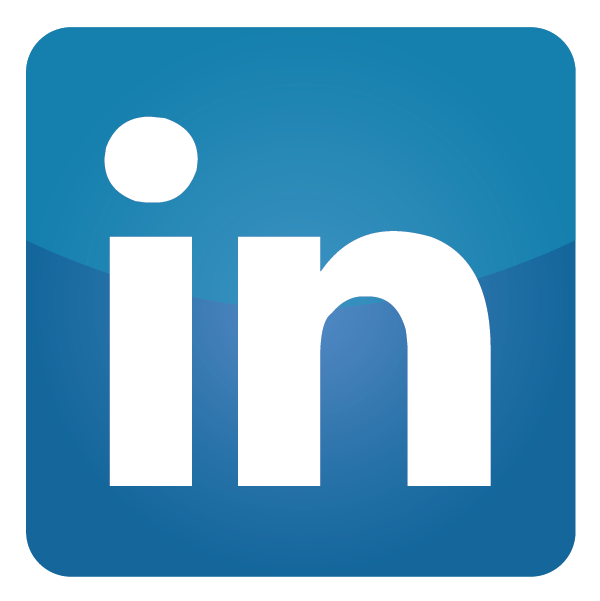 Extended reach: Companies can interact with a global audience to generate a high volume of leads and prospects. To help make the most of your Green Building Expo experience, here are some answers to Frequently Asked Questions (FAQs). 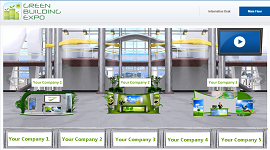 Virtual trade shows are designed for online use, designed to resemble a convention centre, with lobbies, networking lounges and exhibit halls. There are booths for showcasing products and services. An online attendee can view demos, peruse literature, or chat with sales reps in real time, attend keynote presentation and network with visitors from the comfort of his/her office. What is Green Building Expo? Green Building Expo is Canada's premier virtual trade show that connects vendors, manufacturers, suppliers and consultants from Canada's green construction industry with potential customers. The event will showcase products, services, innovations and ideas that are environmentally and economically sustainable. What can I do at Green Building Expo? Exchange contact information and interact with Canada’s green building professionals from the comfort of you desk chair. Interact one-on-one with suppliers and vendors. Download product manuals, demos, brochures, videos on your computer for further reference. Connect with your industry peers through audio, video and text message. Attend expert webinars and keep up-to date with the newest products and technologies. How long will Green Building Expo last? The Green Building Expo, itself, is a one day event scheduled for November 1st, 2017. No one will be able to login before this date. After the event date, all individual booths will remain open and active for 6 months and available online 24/7. The exhibition booths, for example, could function as a website and exhibitors would still able to showcase their information. How do I register for Green Building Expo? 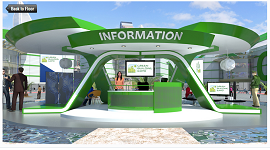 To register, log on to http://www.green-building-expo.com and complete the ‘New Registration’ procedure. Fill out the online form to complete your registration. Once registered, you can access the digital event on November 1st, 2017. You will also receive a notification e-mail confirming your registration and specifying your username and password. I registered for the Green Building Expo but I am unable to log in. Green Building Expo will be live online on November 1st, 2017. Once the event is up and running, you can use the login information (username and password) created at the time of registration to participate in the event. (If you have forgotten your password, reset it using the ‘forgot password’ link on the event homepage.